This is a fashion men watch. The man wristwatch has time, week, alarm and backlight functions. It shows your unique style. Analog-digital time display, perfect for business men. Digital movement provides more accurate time display. PU material band is durable and comfortable to wear. 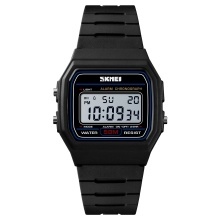 Functions: Time, stopwatch, date, week, alarm, 12/24 hour time setting and back light.